The Memories of Jasper, the Most Wonderful Companion! It is with a heavy heart that I write this about our dearly beloved Jasper. My keyboard is a little soggy, but I will do my best for our best friend “Fluff Ball”. We lost Jasper on October 23, 2018 at the age of 15 years and 4 months. He was a very special dog, so I wanted to put something together to share with all those whose lives he has touched over the years. Our journey together started in Denver when I was a young single guy trying to make it in corporate America. 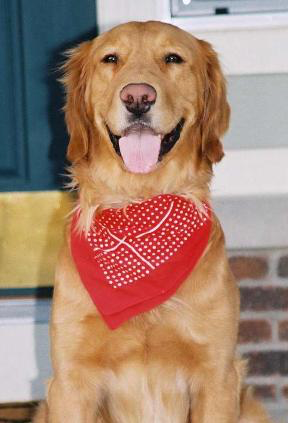 As I had grown up with dogs, many of them Goldens, my mum encouraged me to see if I could adopt a companion. 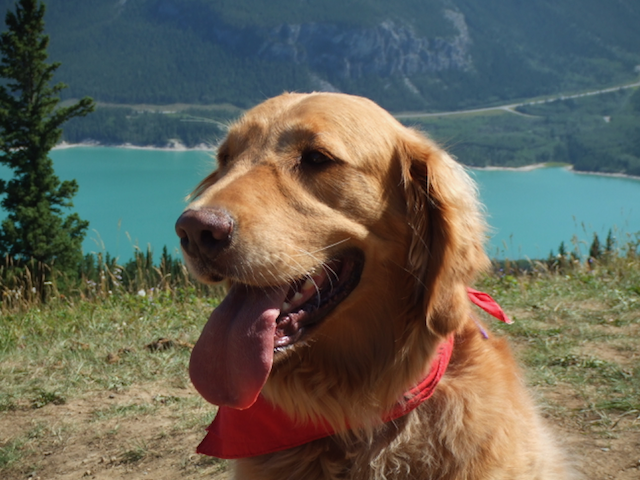 I contacted Golden Retrieve Rescue of the Rockies, GRRR, and they did their vetting to make sure I was an appropriate candidate for one of their rescue Goldens. I was approved to meet one of the Goldens and I went over to their office. They said they had the big guy with quite a large head on him, but he was a great guy. When he came out he did in fact have this big head and a long skinny body tagging along behind. Even though he was 14 months old he didn’t have much fur yet due to his circumstances. He kind of snuffled around and we started to acquaint ourselves. After a bit I sat down on a bench in the grass area and he hopped up on the bench next to me and leaned in and put his big head on my shoulder. Well, that was it, we were meant for each other! I took him home and he had a few issues adjusting. He wasn’t sure in particular about men and didn’t much like strangers or loud bangs as they gave him a bit of a fright. He also was not house trained as I found out in the first few hours together, so that was a task we got on top of right away! Now, as you have probably noticed I have been calling him “he/him” so far and not by Jasper. His original name was Gunner as I believe as his original owners wanted a hunting dog. Well, Jasper is not a hunter, just a big fluffy lover. Wait, if you are a tennis ball or a blue frisbee he is quite the retriever! Anyway, I wanted to rename him and wanted to name him something from where I grew up in Canada. We settled on place names and landed on Jasper, AB in the Canadian Rockies. And he has been Jasper ever since. After about a year with Jasper in Denver I had the opportunity to move back home to Canada. He had been sick a lot in the first year but his health was starting to settle down. One of the bad ones was a spider/bug bite on his nose that made him swell up like a balloon. His nose was twice the size it normally was, Pinocchio would be impressed. 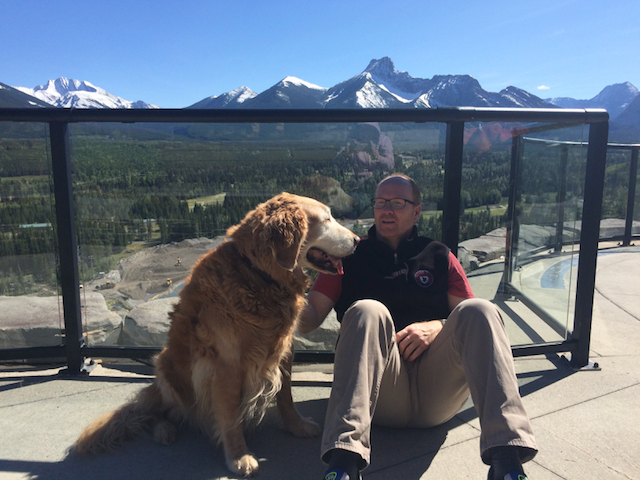 Once in Canada, Jasper settled in well to the colder climate and longer winters. I think he must have decided he was going to stick it out there as shortly after we arrived, he graciously introduced me to my wife. No kidding, this is a true story! I didn’t realize all the places we have been and all the things we have done with Jasper until I went to put the pictures together for this web site. These pictures are a small snapshot of the pictures and things we have done together over the last 14 years. 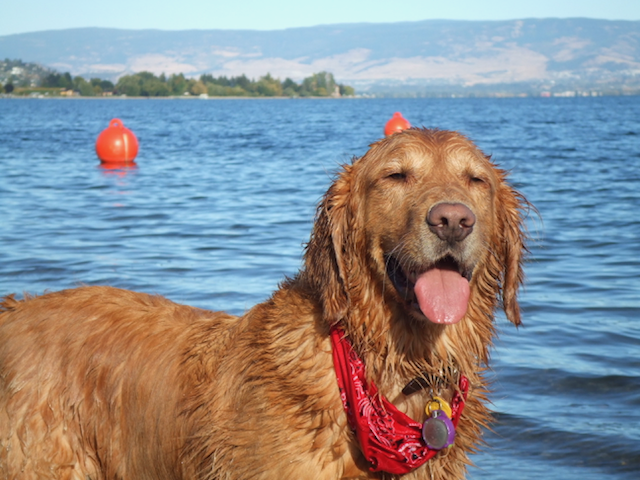 We have traveled all over with Jasper, gone to events, gone hiking, swimming in lakes (usually just him swimming, but not always), and so much more. 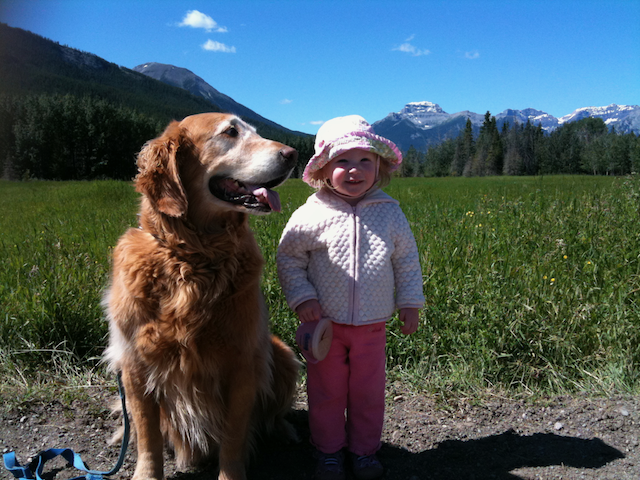 Jasper was all about family and loved to just hang out with all the humans and other furry friends. Jasper was very much a Jekyl and Hyde personality, at the park with a frisbee he would go crazy but would then come home and was a mellow, zen-like Golden. After a few years of just the 3 of us we decided to add some pups of our own, that is what Jasper called them anyway. He was great with our first and really welcomed her home and was a great companion and protector. He would sleep by her crib and the two would snore in unison. He gave us the okay to add 2 more to the brood over the next few years. For number 3 he was now 10 and said that it was enough puppies! He was the most wonderful with them and put up with them stepping on his fur, or poking him more than he would have liked, but he would do anything for them. Even one time a Rottweiler came charging at the kids from across a park and Jasper jumped up and went charging back at the Rottweiler! Thankfully it all ender peacefully and nobody got hurt. I guess the Rottweiler must have thought this Golden must have had something up his sleeve to be charging back and decided to turn back. I tried to explain to Jasper later that he was not a guard dog, but he dared to differ when family was involved. Over the years we had many affectionate nicknames for Jasper. Some of them included Fluff Ball, Fur Ball, Fluffy, Jazzy, Jasper Bear, JB. The funny thing is he answered to most of them and enjoyed the affection. We were worried that with his rough start in this world that he may not have a long life as we all wanted. Boy was that wrong. As the years passed by, he kept getting greyer and greyer, but wanted more than anything to just be with the family. As the children grew older and became more active, he was slowing down and entered into Grampa mode where he more watched them play than playing with them. He felt he had moved into the role of supervisor, something he said he could do even with his eyes closed. 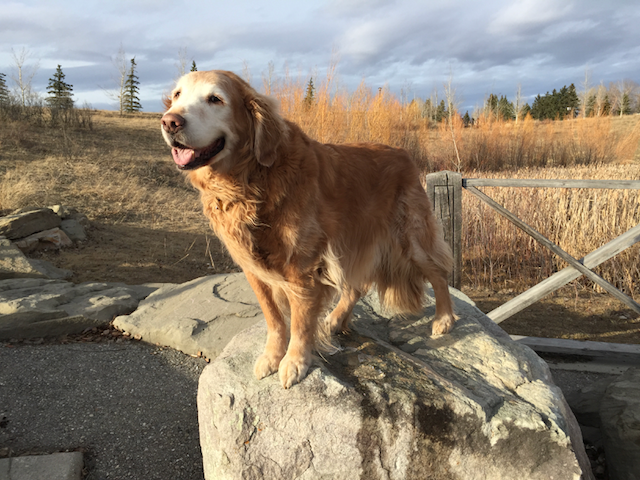 They years ticked on for Jasper and the family, 12, 13, 14…. We calculated out the 7-year ratios for dog to human years and celebrated his 100th Birthday when he was 14.3 years old. Jasper was old yet tough and wasn’t showing any signs of giving in. Shortly before his 15th birthday he was having some weakness in is back end. We put a harness on him to help him up when he was having trouble. He was a little more cantankerous sometimes now and would bark at me to lift him up. Jasper had never barked his entire life other than in special circumstances, so this was a change for him. In the fall he was slowing more but still keeping up a good fight with his loss of strength. On October 23rd, 2018, we peacefully lost our best friend Jasper. We will never forget Jasper and he will live in our hearts forever.